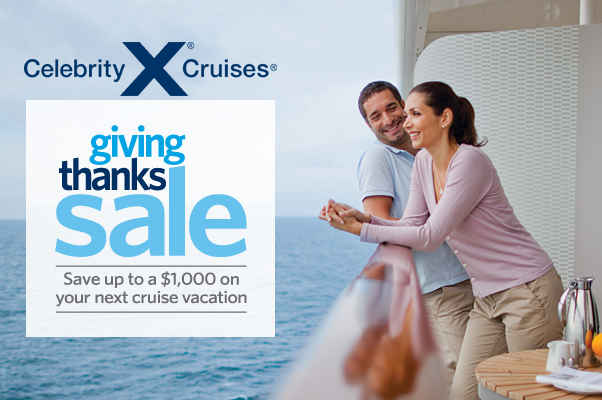 CELEBRITY CRUISES - Thanksgiving Sale. Save up to 15% - Captains Club Members or 10% off all others. 7 Night Alaska from $539 !!! Thanksgiving Sale. Save up to 15% - Captains Club Members or 10% off all others. Akcia pri prilezitosti sviatku Thanksgiving. Usetrite do vysky 15% - pre clenov Captain's Club alebo 10% pre vsetkych ostatnych. It's that time of year for giving "Thanks"
Enjoy 15% off more than 280 sailings in Alaska, Bermuda, the Caribbean, and Europe if you're one of our valued Captain's Club members, and 10% off* the same incredible number of sailings for non-Captain's Club members. It's our way of celebrating your love of travel-especially cruise travel with us. So, join in the celebration and book your next vacation using this extraordinary offer. Highlights: King's Wharf, Philipsburg, St. Thomas, San Juan and more! Expedia® Extras*: Limited Time! Save up to 15%! Highlights: Seattle, Ketchikan, Tracy Arm, Skagway, Hubbard Glacier and more! Expedia® Extras*: Save up to 15%! Highlights: Saint Croix, Philipsburg, San Juan, Grand Turk, St. Thomas, Bridgetown and more! Highlights: Rome, Barcelona, Cannes, Genoa, Bergen, Nice, Santorini and more! Terms and Conditions: *Discount Offer applies to 4-night and longer Alaska, Europe, Bermuda or Caribbean sailings departing Jan. 1- Dec. 31, 2014 ("Offer Cruise"). Cruise must be booked Nov. 1-24, 2013 ("Offer Period"). Classic level and above Captain's Club members receive 15% off the unrestricted standard cruise rate on ocean view and above categories. Valid membership number must be provided at time of booking. Non-loyalty guests receive 10% off the unrestricted standard cruise rate for ocean view and above categories. Celebrity Cruises reserves the right to impose a fuel supplement of up to $10 per guest per day on all guests if the prices of West Texas Intermediate fuel exceeds $65 per barrel. The fuel supplement for the first and second guests would be no more than $10 per guest per day to a maximum if $140 per cruise; and for additional guests would be no more than $5 per person per day, to a maximum of $70 per cruise. One Offer per stateroom. Single occupancy bookings eligible for Offer. Offer is for new individual bookings, subject to availability, may be withdrawn at any time without notice, subject to change without notice, capacity controlled, non-transferable, open to U.S. and Canadian residents only, and not combinable with any other offer. Prices shown in U.S. Dollars. Prices are per person, cruise only, based on double occupancy unless stated otherwise, subject to change at any time without notice and subject to availability. Government taxes and fees are additional. CruiseShipCenters is not responsible for errors that may occur due to the transfer of information from selected third parties, technical error, or human error. Additional terms, conditions or restrictions may apply.